The book encompasses a set of papers on meteorological tsunamis covering various aspects on this rare but potentially destructive multiresonant phenomenon. 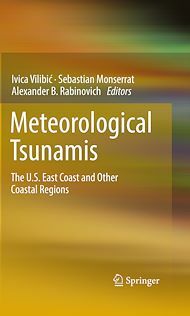 Altogether an editorial and 15 contributions are part of this book; eight of the contributions deal with different aspects of meteotsunamis along the U.S. East Coast and in the region of the Great Lakes, including one paper introducing a new methodology in meteotsunami research. Seven more papers are documenting meteotsunamis in various coastal areas of the world oceans. All continents, except Antarctica, have been covered, with the authors representing 11 countries.